Welcome to 4944 Royal Palm Drive, in the Extremely Desireable 28 Palms SubDivision. 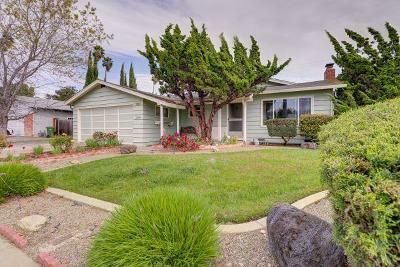 This Home boasts 1584 SF on a large 7200 SF Cornor Lot. This home features 4 Bedrooms, 2 Baths, Living Room and Family Room, Separated by a Beautiful Remodeled Kitchen. Cabinetry By Kraftmade with all Easy Close Doors and Drawers. Beautiful Granite Countertops with a Moveable Matching Island. Beautiful Porcelain Sink. Slide in Gas Stove with Built Mircrowave. This kitchen offers a Sky Tunnel Light and Crown Molding. Floors currently covered in carpet, but underneath is never exposed Beautiful Hardwood Floor. Closets are Cedar Flooring. The Family Room is on a cement floor which has a stylish beamed decor with a sky light. Their has been some updates in the bathrooms. Beautiful yards in both front and back. It also has Gated RV ACCESS on side of house. The Assigned Schools in this area - the desired Joseph Azeveda Elementary, Walters Jr, and Kennedy High ONE OWNER HOME. AS-IS SALE.